Market value $34.99 but yours free, after retweet. Step 1. First, retweet my pinned post (click to open) with the book cover. Twitter account required. Step 2. Enter the email address, where to send your free copy of CSS Visual Dictionary. Also enter your Twitter username, so my script can check you actually retweeted it. Note: the script will check if the post was retweeted from your username! Step 3. Follow me on Twitter (optional) for more free stuff. Hey guys, you've probably landed on this page from one of my free online tutorials or a Google search for a free CSS PDF book download. Rules: Click the Send Me Free Copy button and once my script detects a properly retweeted post on your account page, a free copy of CSS Visual Dictionary will be dispatched to your email address. 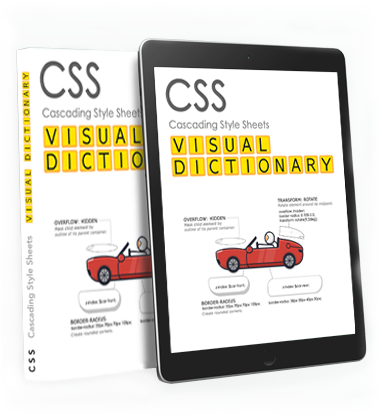 What: Free giveaway of the original manuscript of my book CSS Visual Dictionary (opens Amazon page) in PDF format (It took 4 months to create and it contains a visual diagram of every single CSS property in common use today). Why? I primarily create content to help - not to sell. But, I am owner of a small book publishing company Learning Curve where I am also an only author. Distributing my work in as many ways as possible, accomplishes the purpose of my company. To produce and distribute educational material to help coders and designers learn.